A series of news stories I once wrote about a "dog woman" led me down the dark trail of how we deal with the homeless in America. And the picture that emerged, even before the rash of family evictions across the nation, was ugly. The woman I refer to was a 73-year-old who had her dogs destroyed and her home taken away from her. This happened because she could not afford to fix her broken water and sewer lines, pay the cost of having her garbage removed, or pay to license her animals. Instead of helping her, the police and civil authorities in Michigan made this elderly woman homeless and destitute. I feared even then that this may not have been an isolated case. Bad enough that so many people lack the means to seek proper dental and medical care that failing health and missing or blackened teeth are commonplace among people on American streets. 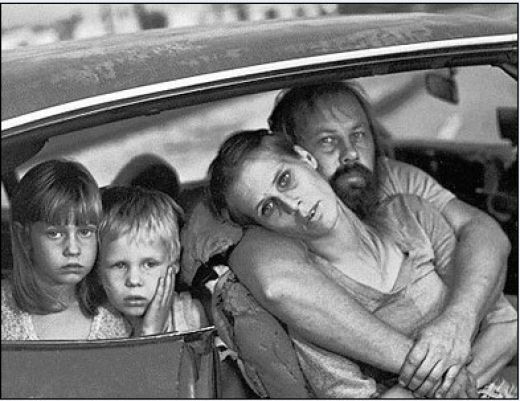 Tragic is the fact that these same people are now going homeless . . . and I fear the numbers may now be reaching the hundreds of thousands. The complacency by the general public, government leaders, police and even many of our churches to this national disaster is alarming. Even though I, as a working newsman, was seeing first-hand the growing desperation, there has remained a tendency by those who still have jobs, who still can manage their house and utility payments, to look the other way. Even as they struggle to maintain their own financial security and worry about losing their own jobs, they want to believe this can never happen to them. They want to believe the problem does not exist. This is not a new phenomenon. I remember walking the streets of San Francisco at least 30 years ago and seeing homeless people sleeping under cardboard boxes in parks, abandoned cars and under bridges. I remember how some southern cities where the homeless were gathering to escape the harsh cold winters, tried to make laws making it illegal to sleep in public places or just sit on public sidewalks. The police were actually trying to drive these destitute souls away rather than offer help. I remember one winter in the late 1980s, when I made several trips into downtown Detroit to research the library microfilm files for a book I was writing. To assure a place at one of the readers I would arrive just before the library opened its doors for the day. Most of the people waiting at the door with me were homeless. Wrapped in heavy winter garb, they had been walking the streets all night waiting for a warm place. Once the library was open, they planted themselves in chairs and tables throughout the building to sleep. The librarians had good hearts and looked the other way. My wife Doris and I became accidentally and temporarily homeless a few years ago after we sold our house, paid off all of our bills and moved to Arizona. Doris, a licensed hospital medical technologist, had supposedly landed a job in a government run hospital on the Hopi Reservation. The facility promised us a house to live in and good wages. Our plan was to live among the Hopi, learn the culture, and I was going to do some writing. Somewhere between the time we left Michigan and arrived in Arizona a few days later, our legislators in Washington became engaged in a fight over the next year's budget. President Bill Clinton put a freeze on all spending, including new job hires. When we arrived at the reservation, the job Doris was promised no longer existed. Even though she was badly needed, the laboratory director was forbidden to hire her. We moved to nearby Holbrook, Arizona, and quickly spent our cash reserves on motels and restaurant food while we waited for a job that never happened. It took us about a year before we both landed jobs and started crawling out of that mess. During that time, we discovered resourcefulness. We found an abandoned motel along the old Route 66, that the new I-40 passed by, where the owner let us stay for something like $12 a night. We were not as bad off as the new homeless. The employment picture in America was still healthy in those days; just not in Arizona. But we were determined to try to make it in that beautiful place and stayed on. I remember the desperate feeling of not having a home. In that period I think Doris and I would have given just about anything for a place of our own. We remember driving down some of those lonely desert roads and looking at abandoned buildings, thinking how tragic it was that someone let them go to ruin. I think the powers that control our lives allowed us to live in that state for a few months so we would have some kind of an understanding of what it feels like to be really homeless. Now as jobs continue to dry up and people are running out of unemployment benefits, the homeless are showing up everywhere. Even people working at jobs paying only minimum wage are starting to lose their homes. They don't make enough money to cover the rent. We notice that now that people are losing their homes, the cost of rent has been rising. A few years ago I was in court to hear criminal matters for the newspaper I worked for. I was shocked when one defendant pleaded with the judge to put him in jail. He said he was homeless and had no place to go if he was released on probation. Jail offered a warm bed, a roof over his head and three meals a day. The county even offered free medical care for the prisoners. I worked on another story where a rural Michigan farm family was struggling to keep the home and the mortgage holder was using every legal means possible to take it away. That family was in desperate straits. The husband was driving truck to supplement the meager income from the farm. The family got behind in the mortgage payments and the bank started foreclosure before these people had the presence of mind, or perhaps the money to hire a bankruptcy lawyer. The local sheriff held a bankruptcy sale after a judge ordered a freeze on the property. My news story about this mess stopped that bank from seizing the property and putting this family on the street. The fix was only temporary. In the end, the family was evicted. This property seizure involved a large family. These people have eight children. Once when I visited the home I counted 11 children. I learned that they were allowing a second, already homeless family to stay with them in an old mobile home parked in the yard. Thus when the bank won this battle two families were made homeless. I lost track of those people after that. I examined the government agencies in place to supposedly help the homeless. I found a county group of noble business people, county officials and bureaucrats meeting monthly to discuss the problem. Yet talking to any of them gave me no answers. They agreed that homelessness existed, but said that they didn’t know how to find these families. They referred me to a lady in the mental health agency who was supposed to be dealing with the homeless. This lady seemed happy to talk to me when I called her. She agreed to send me a "packet" of information and statistics about the state of homelessness in our area. The packet never arrived. When I called back she said a study was being done in a three-county area by the Regional Human Development Commission and that I would be getting a copy of its report in a few days. The report arrived two months after I asked for the information. It said a questionnaire sent to police, pastors, and all government agencies revealed the existence of only six homeless people in that three-county area. It said four more adults were in "danger" of becoming homeless. If this was true, then I was sure that I had personally met all of them. The others magically moved to some other area to find a bridge or cardboard box to live under. I wonder how much the taxpayers paid those blind mice to do this ridiculous study. The money might have been better spent helping a few of those desperate people find shelter. The problem appears to be that once people become homeless, they also become invisible.